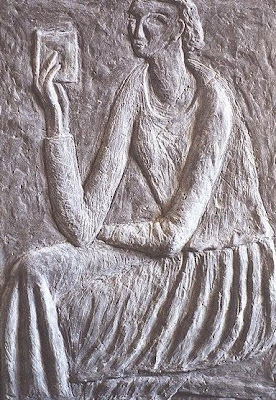 This piece in concrete is based on the painting "Woman Reading" I showed you last Tuesday. I like them both a lot — but this, I think, gives more space for your own imagination. Margaretha, I am surprised by the contrast. I have seen photographs of sculptures before but probably this is the first time that I have seen a painting and then the sculpture. It has so much more life and does, as you say, give more space for the imagination. I'm still trying to put words to my feelings. My fascination has to do with the fact that it has a very contemporary look - but at the same time a timeless feeling. What amazes me is that the texture, although made of concrete, has a soft appearance. Ah, makes me think of Egyptian tomb painting and I wonder why. There is so much of it which is not like that. But enough is. I like this artist's work. I didn't know it until I saw it here. Yes, and like all good art, it looks so easy to make it - until you try it. Like ballet - you think you too can dance like that until you break a vase and your big toe, when you try. That's what I think of too! I'm so glad I found Ruth Addinall - isn't the web fantastic! ?